Axolotl General Discussion Open axolotl forum: if it doesn't fit in the sub-topics then post it here. Hi does anyone know if you get an albino axoltl and it morphes if the salamander will be albino as well? Yes. The pigment cells are absent, and will not develop even during metamorphosis. Not to split hairs Kaysie, but the pigment cells are there. However the stratification of the skin changes and so do the pigment cells at metamorphosis. To answer the original question, once an albino always an albino. 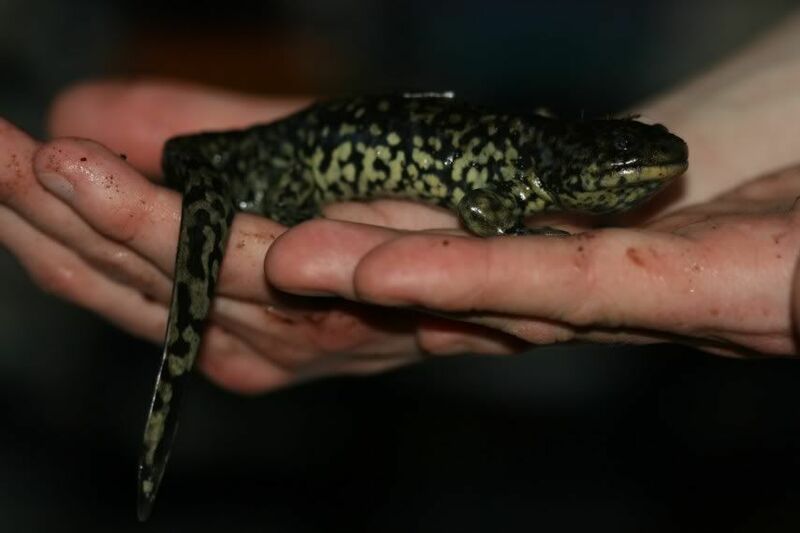 How do Axolotls and terrestial Salamanders breed??? Do they even breed, how is that possible? 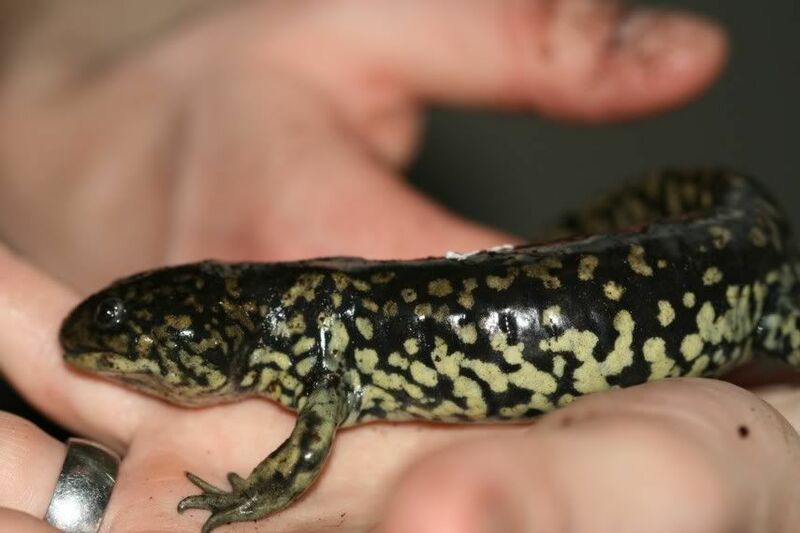 The crossing of axolotls and tiger salamanders happen with a neotenic tiger sal, not a terrestrial one. he is doing SO well!! he is brilliant!!! so so so HUGE lol! His spots are now more defined and now very very camoflauged!!!! thank you to all of you who have been watching this story! too many reptiles to name!!! I would love to see a picture :), please. Ill get some new pics tommorrow for you but a few weeks back i took these, this is of him wet, he had been for a dip!!! normally he is all eco earthy!! covered on it! See how big he is? on grahams (my OH's) hands..
i find his colour amazing, he was a black axy, and he went this brilliant camoflagued colour! p.s john, i hope you like the pics? Loverly! Thank you :). He is very pretty. He must be 9 or 10 inches now? yup about 9 / 10 inches, and so VERY chubby!!! he remidns me of a leo (leopard gecko) he sits next to his bowl every night, waiting!!!! lol (with his head in the bowl!) ill take a pic next time he does it! so very very cute!! 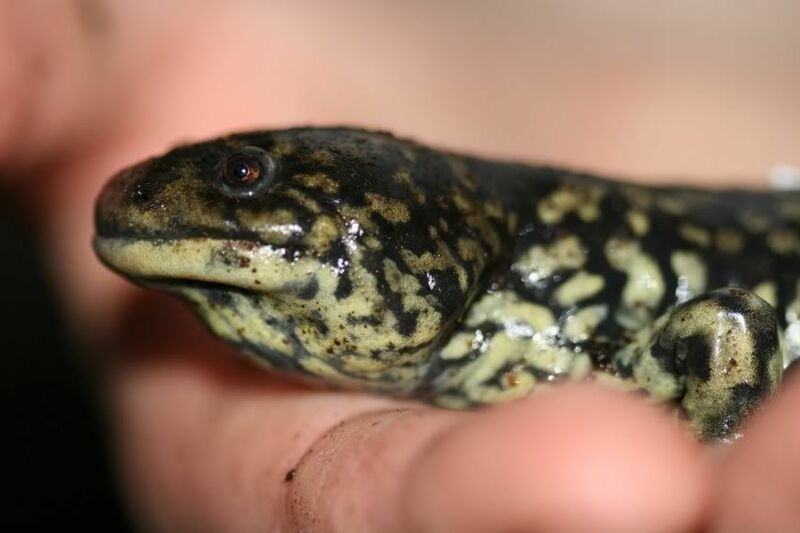 I think it looks more like a Tiger Salamander... how long have you had it? I really don't want to seem rude or nosey, I'm just very confused about this whole morphing thing, someone said that freeky was given wrong advice and so the axolotl morphed before he could do anything about it and it was not his fault. So what exactly happened? What was the bad advice? Even though that creature looks really pretty and healthy too, and I'm sure it has a fantastic quality of life, but I was under the impression that in the wild natural habitat where all their requirements are met, all axolotls morphed? Is this not the case? Amanda, the toes are a dead give-away. Tiger sals have 'sausage toes', while axolotls have thinner toes. I just wanted to add prophylactically that Freeky's axolotl is a rare and special animal. Most axolotls do not morph if kept in poor conditions. They just die. But i wonder how long he will live. Axolotls that morph naturally can have a pretty normal life span. Axolotls that are forced to morph (usually through chemicals) tend to not survive very long. I disagree. Axolotls that metamorphose post sexual maturity generally don't live very long. Those that metamorphose prior to sexual maturity usually have normal lives (even if the metamorphosis is induced). I believe my axolotl has metamorphed! We received the axy as a birthday present for my son in May. So, we have had him for about 2 1/2 months. The instructions given by the pet shop were little. Simply keep the water fresh and cool and to feed him Newt pellets every 2 days. The pet shop had the axy listed it as a Baby Dinosaur. Axolotl was never mentioned. I had to research online to find out what exactly it was. He (I assume it is a he, I have no idea) metamorphed about 2-3 weeks after receiving it. I did not know that this was abnormal. I thought perhaps they were supposed to do this. I thought maybe they went through a spring-like change and then would go back to the normal axoltl look after a while. Shows how ignorant I am in caring for the axolotl!! He has been living in water the entire time. He hangs out at the bottom for the most part, but occasionaly rests on top of a log that we have in there for him. The only reason the log was in the tank was because the pet store told us that he could come out of the water for short periods of time. I am now to the conclusion that the pet shop has no idea what they are talking about, and I need to know how to properly care for the axolotl. He seems happy and healthy, though I really have no idea. He will follow me around the tank looking at me. He still eats about 6 newt pellets every 2 days. If I drop the pellets in the water he will eat them there, if I put them on top of the log, he will eat them there too. I change his water every two weeks. And treat the water with a "tap water conditioner" (like the pet shop told me to do). Someone please help me!! I have no idea what I am doing!! I have attached photos for you. In all the photos he is in the water at the bottom of the tank. I have a 10 gallon tank filled a little under halfway. In the last photo he is swimming up to the top (trying to get a pellet I put on top of the log for him).